If the way to a man’s heart really is through his stomach, then a gourmet lunch or unique gentleman’s afternoon tea at a luxury country house in the New Forest is the perfect way to say thank you to the most important man in your life this Father’s Day. The Montagu Arms in the charming village of Beaulieu is steeped in 17th Century history and is home to the award-winning Terrace restaurant, where head chef and Roux Scholar Matthew Tomkinson dreams up delicious dishes inspired by the superb forest larder on his doorstep. Dads are sure to fall in love with Matthew’s sumptuous three-course meal, created especially for Father’s Day on June 17. Dishes will put the focus firmly on seasonal ingredients like English asparagus, peppery watercress, Jersey Royal potatoes, local Pondhead Farm beef and pork, and summer truffles. Alternatively, dads can sit outside in the glorious English country garden and enjoy a special Gentleman’s Afternoon tea. 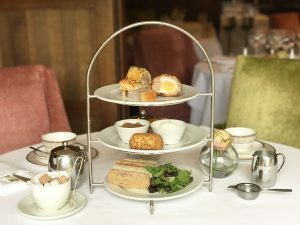 The Montagu Arms has created tea with a twist, putting the emphasis firmly on sumptuous savouries and showcasing a selection of favourite English classics. Dads can expect homemade Scotch eggs and moist beer cake to sit alongside traditional finger sandwiches and feather-light scones smothered with jam and lashings of clotted cream. Whether you opt for lunch or tea, there’s plenty to do either side of your meal – peaceful riverside or woodland walks and miles of cycle routes sit alongside the famous visitor attractions of Beaulieu Palace House and National Motor Museum, and the historic shipbuilding village of Buckler’s Hard. With gourmet food and stunning surroundings, the Montagu Arms is the perfect place to spend a Father’s Day to remember. Father’s Day Gentleman’s Afternoon Tea will be served on June 17 from 3.30, and costs £27.50 per person, or £38.50 with a glass of Champagne. Father’s Day lunch at The Terrace on June 17 costs £49 per person, and £25 for children under 12.